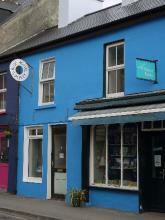 Blue House Gallery was founded in 2013 and following the usual teething pains of a new gallery seeking to define its areas of interest, it fairly quickly emerged as a leading contemporary art gallery with the remit of promoting the best work being done in West Cork in painting, sculpture, printmaking and ceramics. Added to supporting local artists with solo, joint, group and themed exhibitions, it also brings shows from around Ireland and abroad to contribute to the mix of provocative and interesting exhibitions. An additional area of interest is in work related to anthropology and antiquities. The Gallery’s annual exhibiting season runs from Easter to the end of September, generally opening with a group show of a wide selection of the artists associated with the gallery, then moving into the main programme of showing new work by the Gallery’s group of regular artists, but also showcasing emerging talent. Applications by new artists are always welcome at Blue House Gallery. To any artists interested in showing with the Gallery, submission of half-a dozen characteristic pieces of recent work will be responded to by the curators.